Outfit by Jimmy D from Until the Light Takes Us, Autumn/Winter 2011, recently acquired by Te Papa. The print is by Andrew McLeod. This week I am attending my first ever full Fashion Week. A Fashion Week that might, according to newspaper reports, be New Zealand’s last – at least while the recession digs its toes in. Yesterday I attended two shows that while wildly diverse reflect two aspects of current activity at Te Papa. My first show of the day was Jimmy D’s It’s a Kinda Magick. In keeping with Jimmy D’s signature aesthetic, it was a dark and magical show that demonstrated the designer’s (James Dobson) understanding that a catwalk show is not just showing clothes – it is about creating a mood and a sense of growing drama. Set to a soundtrack mixed by Tony ‘T-Bone’ Wehner, it was a holistic, well paced show in which a tribal narrative unfolded. Jimmy D’s show was particularly interesting as Te Papa has recently acquired a complete outfit from his 2010 Fashion Week show, Until the Light Takes Us. For both collections Dobson collaborated with artist and musician Andrew McLeod who is also represented in Te Papa’s collection. 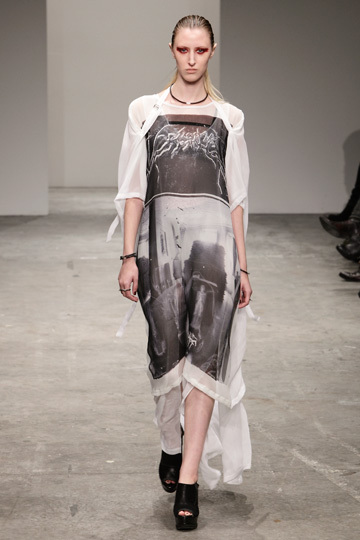 Until the Lights Takes Us features black metal inspired prints on over-sized, flowing tees in silk georgette. Dobson’s muse for the collection, which went on to inspire a short film by Oliver Rose, was an ‘uber Goth Girl’. For Its a Kinda Magick, McLeod created Chinoiserie-inspired prints mixed with images of brain scans, circuitry and burgeoning flowers. Inspired by clothing in motion – ‘I love drape, and I love having a garment sweep seductively over the form of the body and then swing wildly away from it’ – the prints energetically ripple across billowing swathes of silk, which were at times are bound with leather harnesses and studded with spikes. As the press release ran: ‘Last winter’s black metal girl has grown up and fallen in love with a futuristic clan of warrior witches’. Jimmy D It’s a Kinda Magick, 2011 NZ Fashion Week. While Jimmy D presented a clan of dark witches and warlocks, the following show presented the lighter side of fairytales – the fairytale bride, which of course is the subject of Te Papa’s upcoming exhibition from the V&A, Unveiled: 200 Years of Wedding Dress. While the New Zealand Wedding Show started surprisingly with with a heavy metal sound track, it was soon all swishy fabric, sparkles and romance (albeit the young models all looked like child brides). The show featured a range of designers including John Zimmerman, Vinka Design, Sera Lily, Alma J and A La Rose. Wedding gown by John Zimmerman. 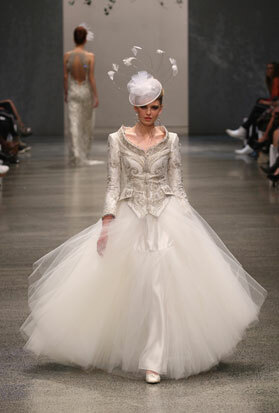 I will post more on the subject of wedding gowns on Saturday as we have a surprise to reveal. But in the meantime, you might want to tune in to TV3’s NZ’s Next Top Model this Friday night for a preview of a very special gown, the behind the scenes story of which we will reveal soon!